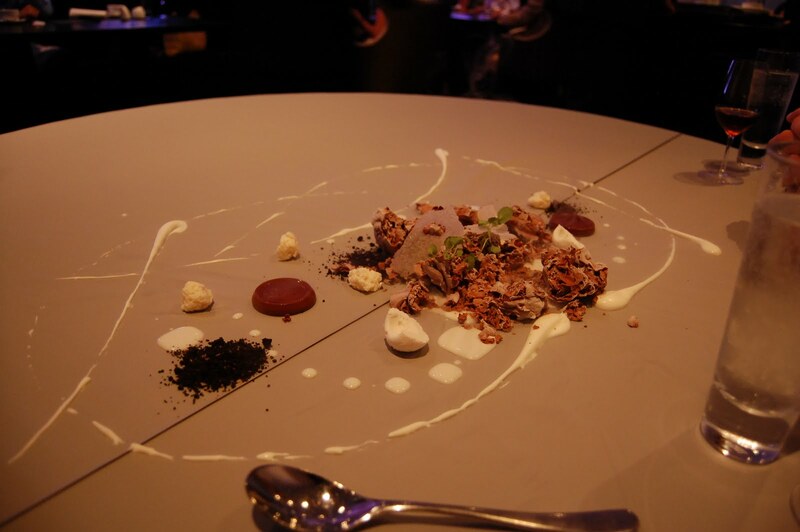 Alinea – or a trip down the rabbit hole. Chicago is a delicious city. We planned our short trip to Chicago with two things in mind, architecture and food. And…secretly I thought of Oprah (a lot). The overwhelming choice of delicious food options was terrifying. Do we go to Alinea? Charlie Trotters? L20? Graham Elliot? Avenues? Where do we choose for the classic deep dish pizza? or the Chicago dog? And is the Garrett’s popcorn really worth the hype? 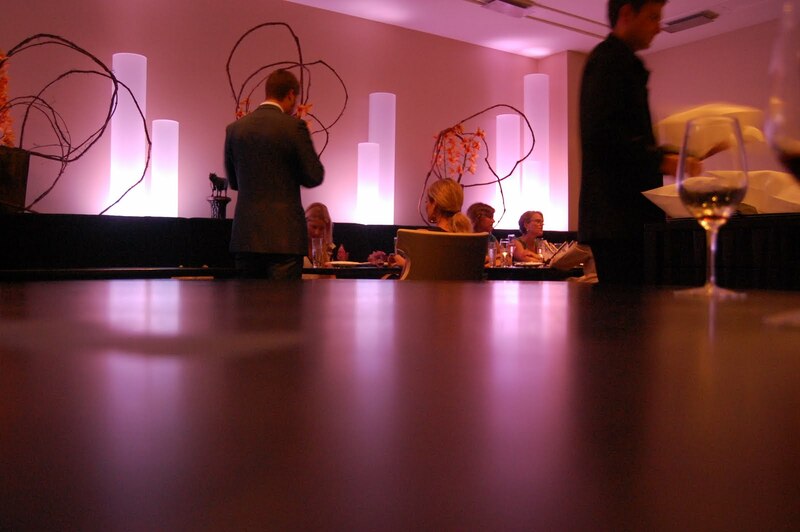 After much humming and hawwing (more hawwing then humming, really), I called Alinea. 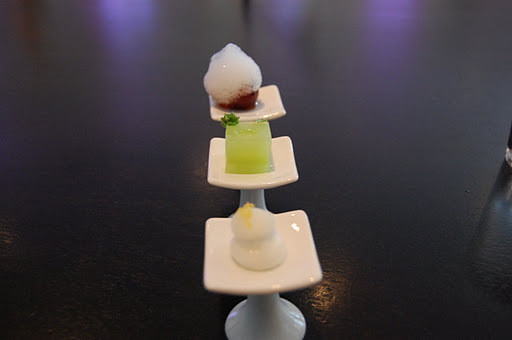 I bit the bullet and decided that if we were going to Chicago we had better try to get into Grant Achatz’s molecular gastronomy temple of eating, and the 7th best restaurant in the world, Alinea. So I call…..and there is no availability. I am crestfallen. My husband calls again the following week and gets us on the waiting list. Two weeks go by. Two nights before we are set to leave, Alinea calls. We have a seating for the 5:30 (early bird special) on Sunday. Victory! I had heard about the entrance to Alinea. How strange the dark hallway was, and disorienting the seemingly wavy pink-lit walls are. And then, a metal door opens and you are welcomed into the restaurant. The serene, and empty, dining room and army of servers make me feel slightly uncomfortable. 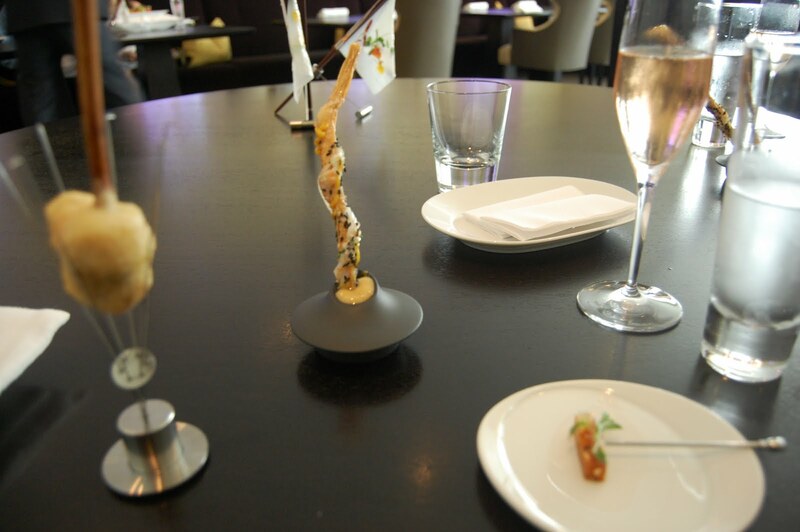 We have no menu, there is only one per evening, a 22 dish tasting menu. We opt for the wine pairings, as well. And we’re off. The cavalcade of playful, witty, strange and delicious food begins. Thank goodness they gave us a commemorative menu at the end, because I could have never remembered all of the courses. Our 1st – 3rd course. Three cocktails synthesized into three bites. 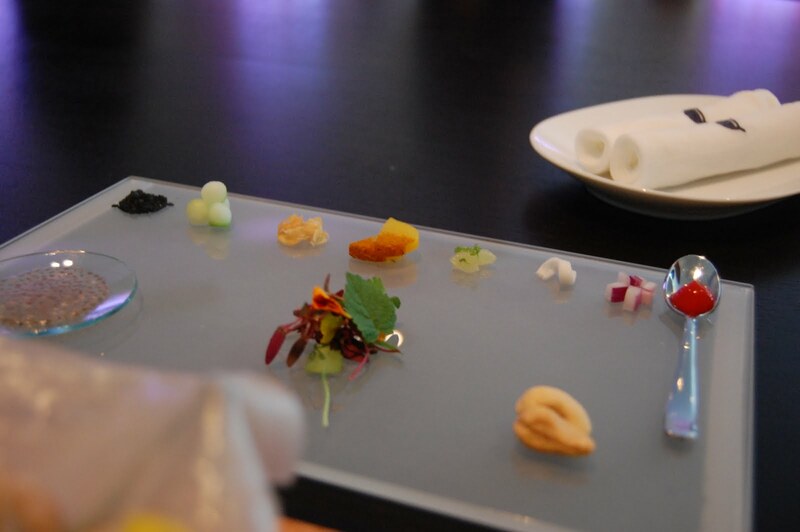 This course is exactly what I expected of Alinea, playful bites, masterfully thought out renditions of the originals. What we were actually thinking at this point was…. Are we going to be hungry at the end? 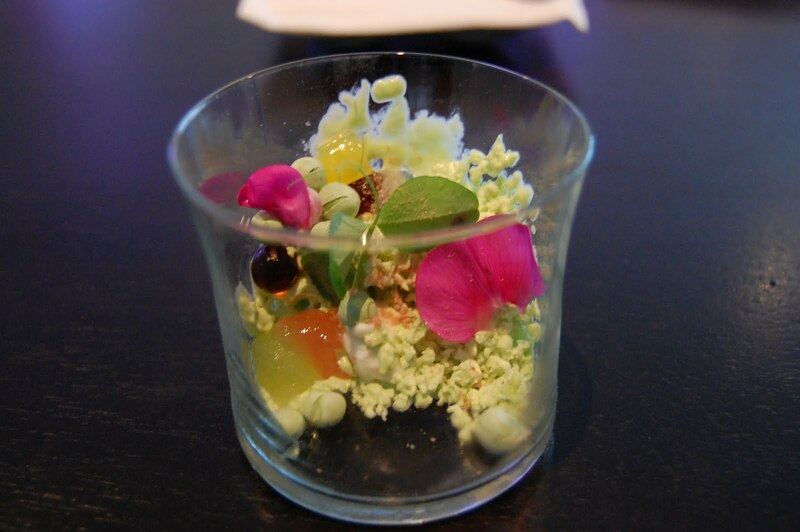 I think this was one of the most beautiful dishes we ate during the meal. It looked like an english garden, with flower petals, liquid nitrogen cold peas on burrata with iberico ham, sherry and honeydew jellies. 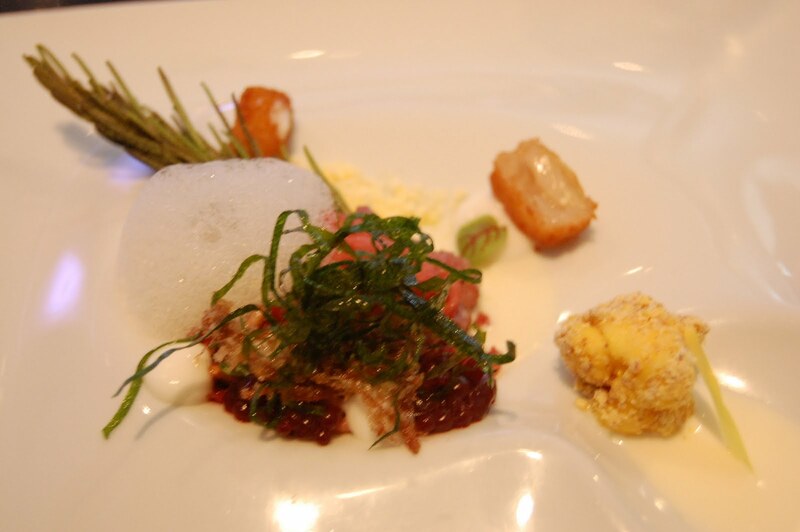 This course had me worried, was the whole meal going to be like this? It looked beautiful but the flavour was so intense and rich I did not want to finish it. In truth, I didn’t like this course. Shhhh, let us never speak of this again. Our 5th – 8th course. Oh no. On the heels of the last worrisome course comes Yuba, or tofu skin. I am not a picky eater, but I do not, do not, do not, like tofu products. Guess what? 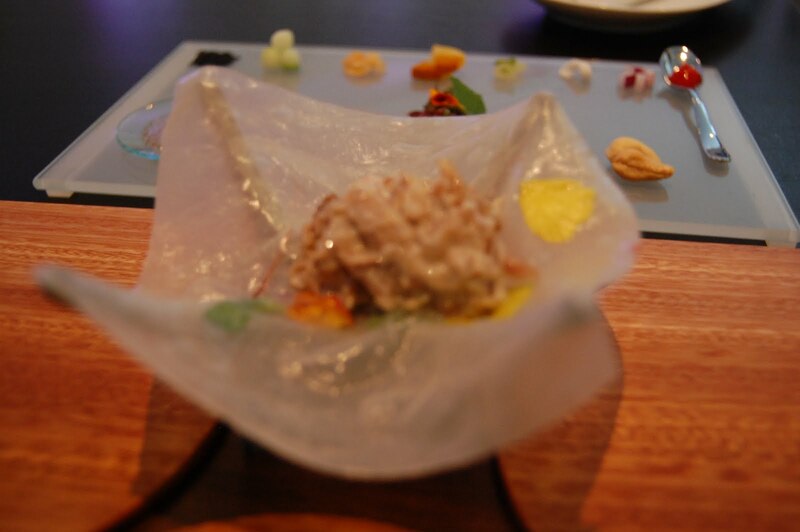 Delicious, at Alinea, not at the local thai restaurant, though. 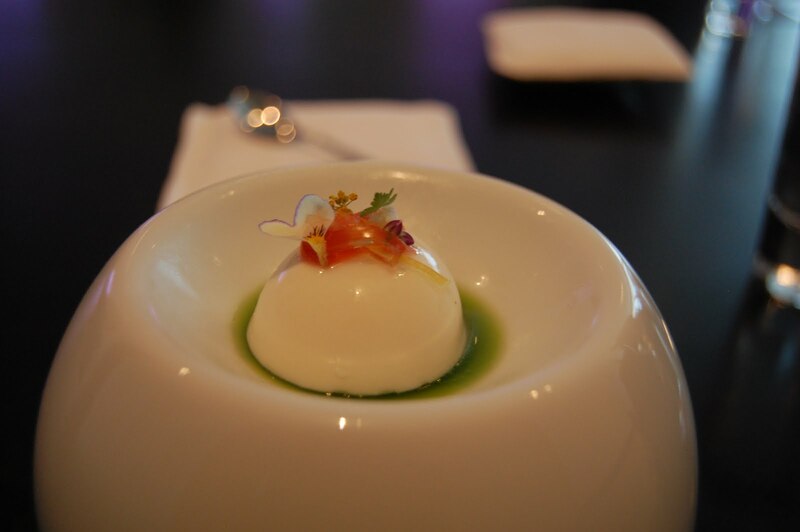 I will only eat tofu when Grant Achatz deems it necessary. This course was a bit strange, but fun. The cinnamon stick held a high class deep fried shrimp ball. The Yuba was gorgeous. The sugar cane, which was vacuum sealed with shrimp stock was shrimpy. Overpoweringly shrimpy and sweet. But interesting. This course excited me to no end. I had heard of the aroma pillow and now I got to experience it. A pillow filled with grass aroma was put down in front of us. The plate of tomato heaven was placed on top, releasing the fresh cut grass aroma slowly as we ate. I wondered where they got the grass. Was it organic? Is it synthetic grass smell? How do they do that? 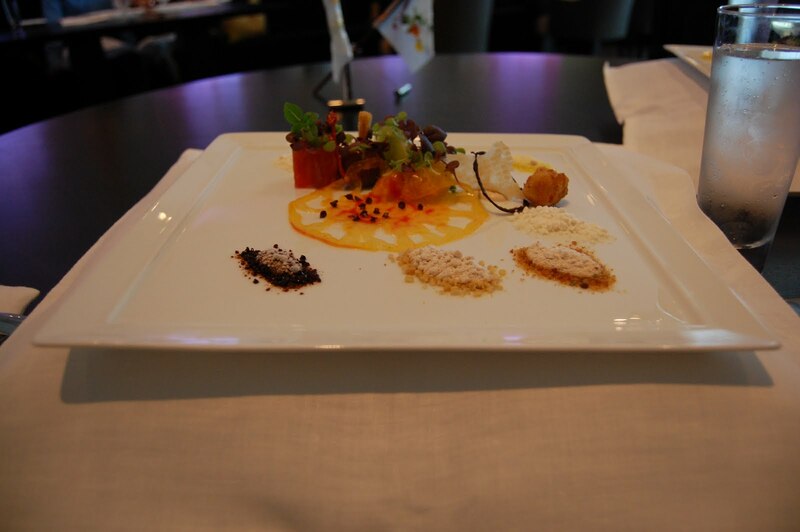 The tomato course was one of my favourites. The heirloom tomatoes were perfectly ripe and surrounded with the most amazing powders and crumbs and greens. Balsamic powder, italian bread crumbs, olive oil powder, parmesan cheese. Micro greens I had never seen before. Sublime and gorgeous. Our 10th & 11th course. This course was fun. Our decorative flags would finally become food. We were asked to assemble our serving dish and place our rice paper flag on top. Berkshire pork belly was added to our rice paper and we were told to assemble our own spring roll with all the gorgeous ingredients they laid out for us. Delicious, “simple” and fun. Easily, the best spring roll I’ve ever had. This was an interesting course. 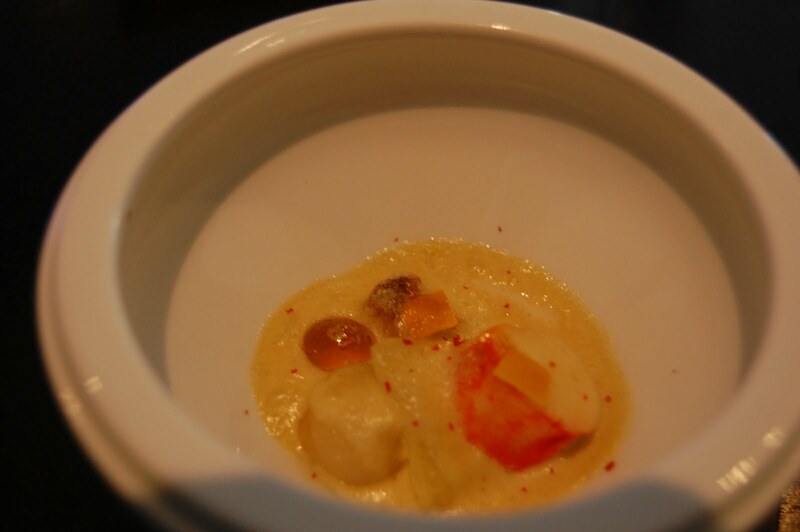 One serving dish, like a matryoshka doll, with a crab mousse on top, cold crab in the middle and a warmed crab in a fennel custard on the bottom. Each dish had the same ingredients used in a different way. The crab mousse was again, too rich for me, but beautiful. 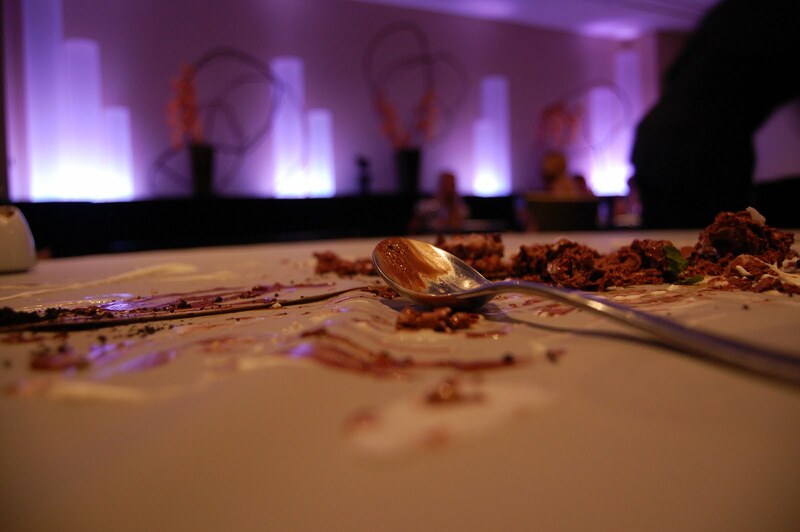 The middle course was my favourite, the sensation was crisp and fresh, the antithesis to the richness of the first layer. also known as: The course that made me gag at Alinea. This tiny course packed a huge punch. 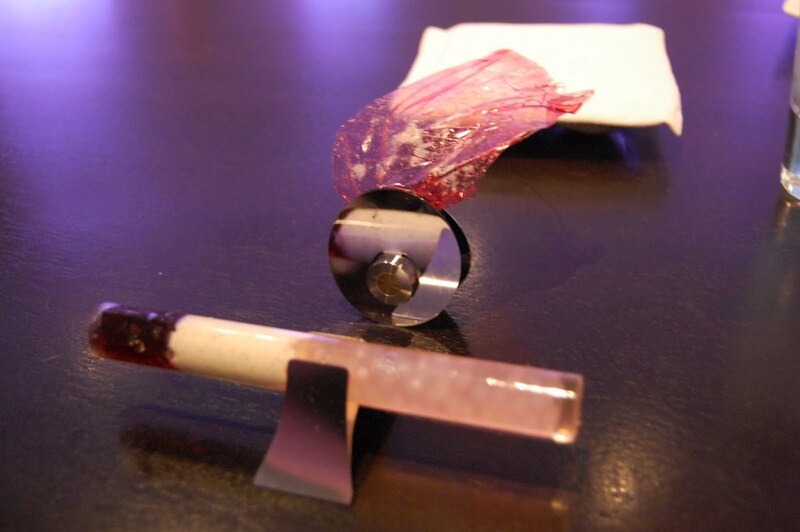 I actually gagged at Alinea. The waiter came over and said “Is everything okay?” Luckily I had drank enough of the delicious wine offerings to not feel as mortified as I might have otherwise. I have a bit of an aversion to truffles. This is not the first time I have done a “shot” of black truffle and gagged. 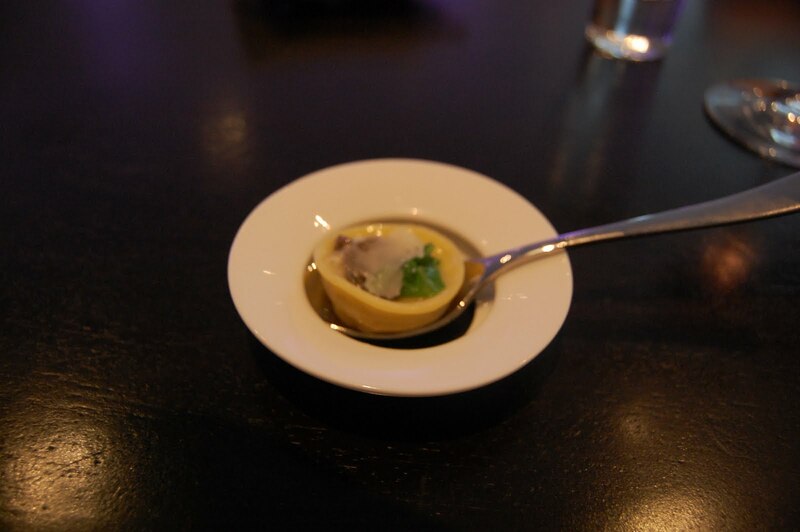 This course was tiny, a small amount of potato soup, a hot potato, a black truffle and butter released when you pull the pin, pop it into your mouth. And swallow. Or not, in my case. Please excuse the blurry photo, after the embarrassment of the previous course, I was trying to be inconspicuous. This course involved delicious lamb and foam and sweet corn soup and one of the best bites of my life – a crispy piece of lamb fat. Doesn’t sound appealing? It was. uh oh. truffle explosion? I did it, it was okay. I swallowed. This course blew me away. It was perfection on a plate. The setting of heavy silverware and an antique crystal glass with the gold rimmed plate was perfect for this homage to Escoffier’s classic dish. Australian wagyu sat atop banana and tomato. Banana! Amazing. This was one of my favourite dishes. The sauce was crystal clear and gorgeous. 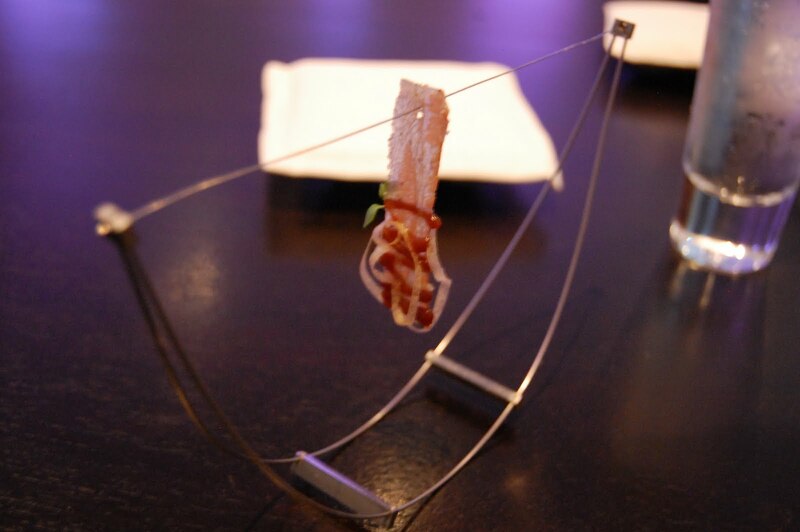 A bacon swing. Childhood dreams come true. It all happened so quickly I didn’t take a photo. They brought over two tiny little pill-like squares. We ate them. Fizz. Lemon. Yum. Our 19th & 20th course. The raspberry transparency was fun. It tasted like crunchy raspberry. It complemented the tube of “bubble gum” we were instructed to slurp back in one shot. It tasted like bubble gum, very fancy bubblegum. A terrible photo of a delightful course. 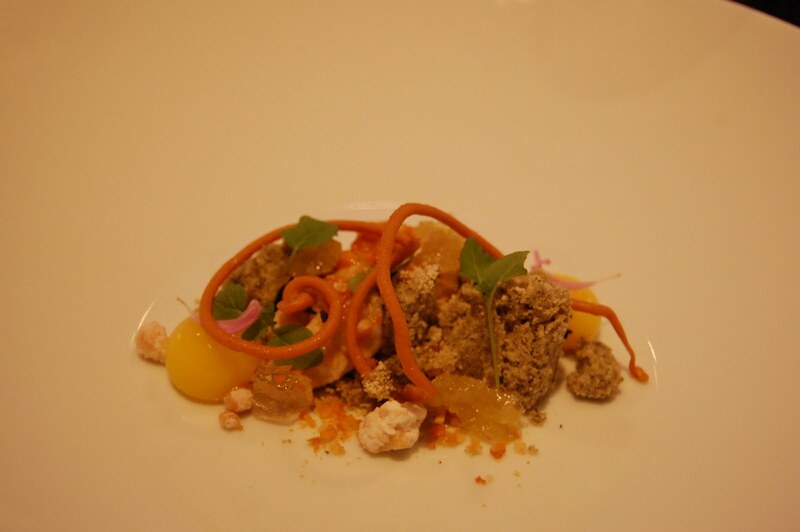 The base was a creme earl grey crumb with lemon “yolks”, pine nuts and white chocolate. This was the show stopper, a last course I never dreamed possible. As we ordered coffee and drank our tawny port from 1968 (!!! ), our table was covered in a silicone tablecloth. One of the chefs came over and began painting our table with coconut sauces, menthol sauce, micro-mint and perfect circles of chocolate pudding. In the centre of all this craziness, a block of nitrogen frozen chocolate mousse was placed, and cracked open, cold air streaming out of it. We ate and ate and laughed and ate. Until we could not eat any longer. We were happy to have taken the trip down the rabbit hole, until the bill sent us reeling back to reality. We were instructed to rip the bacon off the wire and eat. I swung it a bit first, I couldn't help it. 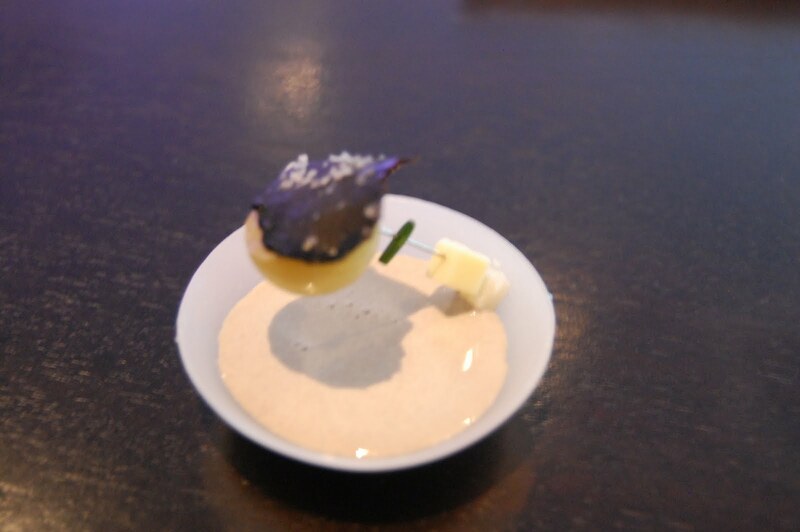 That was Chris's favourite bite at Alinea. How could you not love bacon with caramel? Doctor, Doctor, we have a case of bottom end rot. 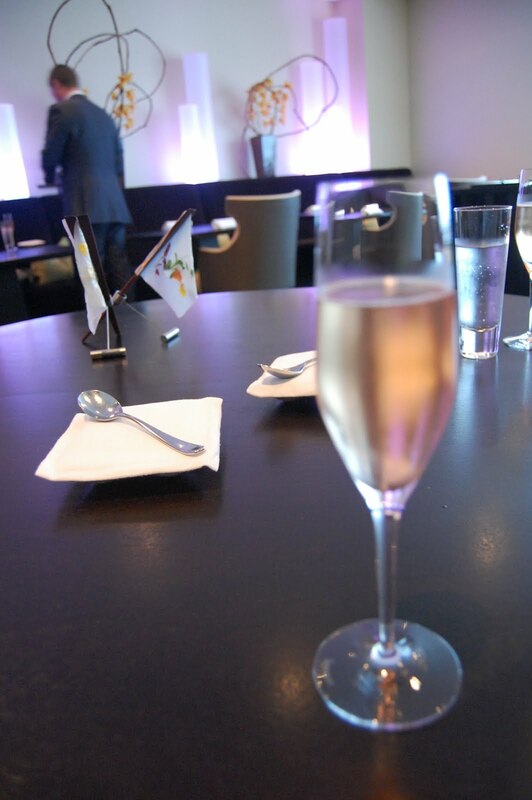 L20 & a fine dining hang-over.